Gilded Age America saw not only a boom in millionaires, but a boom in immigration. During this era, approximately 10 million immigrants entered the United States, hungry for religious freedom and greater prosperity. The most striking of these immigrants were Eastern European Jews fleeing the brutal pogroms of Imperial Russia between the years 1881-1924. The surge in population witnessed in America’s major cities created a number of conflicts, particularly in politics and government, as witnessed with the strong hold Tammany Hall held on New York City long after the death of Boss Tweed. Yet, this new power in numbers did little to protect these new Americans from exploitation and betrayal from power- and money-hungry politicians and robber barons. Troubles came not only from “native” Americans angered by the threat immigrants had to their jobs, but from exclusionary laws passed to keep “undesirable” minorities–like the Chinese–from entering the country to work for wages even lower than those garnered by European immigrants. 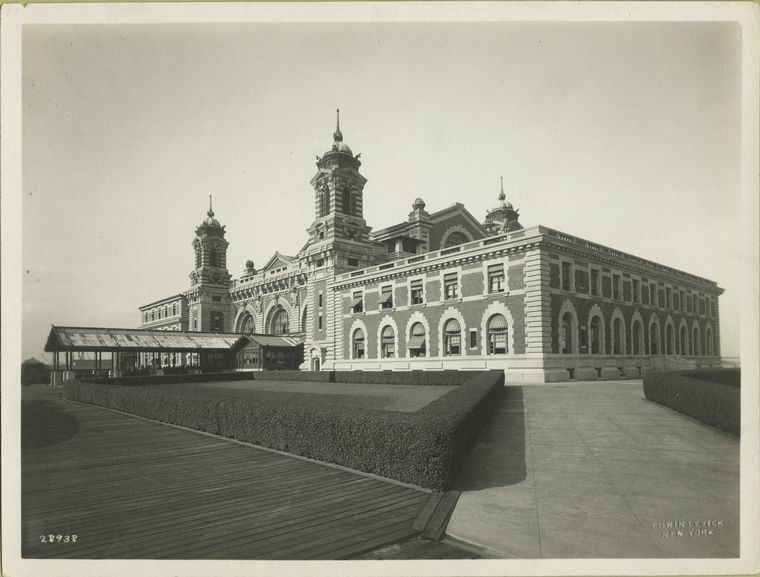 To stem the influx of peoples seeking asylum and citizenship, the U.S. Federal Government built Ellis Island Immigrant Station in 1892, about half a mile from the Statue of Liberty, to replace the state-run Castle Garden Immigration Depot (1855–1890) in Manhattan. The first immigrant to pass through the gates of Ellis Island was Annie Moore, a 15 year old from Cork County, Ireland. During that first day, 700 immigrants were processed, and in its first year, Ellis Island processed almost 450,000 immigrants. Disaster struck soon after, for on June 13, 1897, the original wooden structure burned to the ground, destroying all administrative records for Castle Garden, and most of the records for the Barge Office and Ellis facilities. Fortunately, copies of the passenger lists were held by the Customs Collector and abstracts were held in Washington, DC. The station reopened in 1900 and was built of red brick and more importantly, was fireproof. This new building was also much larger in order to accommodate the 5000+ immigrations streaming through the island daily. Immigration peaked in the years leading up to WWI–1907 processed a record of 1,004,756 peoples, and April 17th of 1907 witnessed and all-time daily high of 11,747 immigrants. 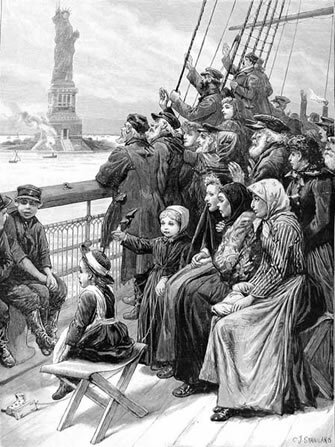 The great number of immigrants of the “new immigration” era–that is, emigrants from southern and Eastern Europe, Asia, and the Middle East, as opposed to “old immigration” from Western Europe–caused many native-born Americans to grumble that the United States had become a “dumping ground” rather than a “melting pot.” To make matters worse, these immigrants appeared to bring the fears of native-born Americans to fruition: they were dirty, foreign, prone to crime, refused to learn English, practiced weird customs, sent good American money back home rather than spending it in the US, and otherwise wreaked havoc on the sedate, Anglo-Saxon lives of “true Americans.” To combat this, Congress passed a series of immigration laws which at various times excluded, restricted, or refused emigrants from particular countries. In 1882 Congress passed the Chinese Exclusion Act, and in 1907, the Dillingham Commission tightened the medical requirements for admission, dividing physically and mentally “defective” immigrants into three classes: idiots, imbeciles, epileptics, the feeble-minded; the insane; and those subject to tuberculosis or a dangerous disease. The average wait on Ellis Island was about two to five hours, but for those whom health inspectors held back, the island became “The Island of Tears” or “Heartbreak Island.” Many spent months in quarantine ,or were held in the detention quarters, before the immigration officials rejected their application for entry and deported them back to their homeland. After an arriving ship passed the quarantine inspection in New York Harbor, Immigration Service (IS) and United States Public Health Service (PHS) examiners boarded and examined all first- and second-class passengers as the ship proceeded up the harbor. Upon docking, PHS officers transferred steerage or third-class passengers to Ellis Island by barge. Proceeding one after the other and lugging heavy baggage, prospective immigrants entered the station and moved slowly through a series of gated passageways resembling cattle pens. As they reached the end of the line, they slowly filed past one or more PHS officers who, at a glance, surveyed them for a variety of serious and minor diseases and conditions, finally turning back their eyelids with their fingers or a buttonhook to check for trachoma. 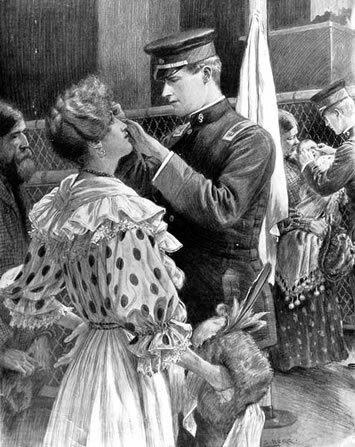 PHS regulations encouraged officers to place a chalk mark indicating the suspected disease or defect on the clothing of immigrants as they passed through the line: the letters “EX” on the lapel of a coat indicated that the individual should merely be further examined; the letter “C,” that the PHS officer suspected an eye condition; “S” indicated senility; and “X,” insanity. 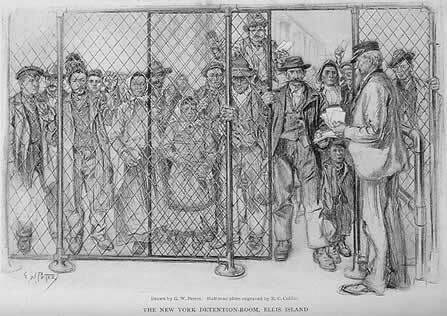 The procedure was intimidating, and, indeed, between 1891 and 1930 nearly 80,000 immigrants were barred at the nation’s doors for diseases or defects. Yet the vast majority were allowed to enter the country—on average, fewer than 1 percent were ever turned back for medical reasons. Of those who were denied entry, most were certified, not with “loathsome and dangerous contagious diseases,” but with conditions that limited their capacity to perform unskilled labor. Senility (old age), varicose veins, hernias, poor vision, and deformities of the limbs or spine were among the primary causes for exclusion. That so few of the more than 25 million arriving immigrants inspected by the PHS were excluded sets into bold relief the country’s almost insatiable industrial demand for cheap labor. Immigration through Ellis Island slowly trickled to a halt during World War One, but there was a post-war boom that Congress once again severely curtailed through a series of immigration acts: the Emergency Quota Act in 1921, followed by the Immigration Act of 1924, which was aimed at further restricting the Southern and Eastern Europeans who had begun to enter the country in large numbers beginning in the 1890s. The latter act placed a quota on European immigration, allowing no more than 2% of the 1890 immigrant stocks into America. In addition, Congress had already passed a literacy act in 1917 to curb the influx of low-skilled immigrants from entering the country. How interesting! I was just reviewing my great grandfathers entrance forms, no X’s of course, he made it in safely! I’ve been to Ellis Island. It was kinda cool. Even though the process sounds very intimidating and martial, it seemed like the vast majority of people had positive experiences there.